Winter is coming and the Sigel of House Stark harks back to the last long winter when the across the north of Westeros Dire Wolves roamed. Renowned for their strength, the Starks took the image of the wolf for their own. 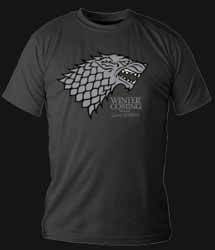 Set against the grey background of the tee shirt the stylised wolfs head makes for a pleasing addition to the collections of any fans of house Stark. The wolf is blue/grey, matching that shown on the show. This HBO licensed product comes in small, medium and X large, which should cater for anyone between an Arya to a Samwell Tarly.